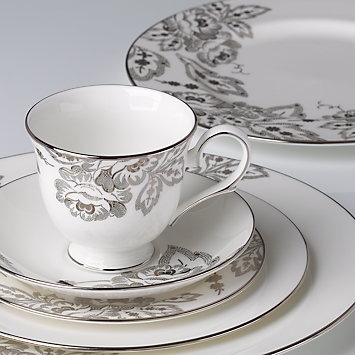 Choreograph a beautiful table setting with Floral Waltz china by Lenox. A detailed floral motif - made up of hundreds of dots - dances across the bone china. Diameter of dinner plate: 10 3/4", salad plate: 8", butter plate: 6", saucer: 6"; capacity of cup: 8 oz.